Measurements: 2.65 x 4.45 inches; or 67 x 115 millimeters. Back of card: Black, with a pentagram surrounded with cosmic circles. At the very center, a rose. Booklet included: Yes, 29 pages, 2.6 x 4.5 inches; or 65 x 113 millimeters. 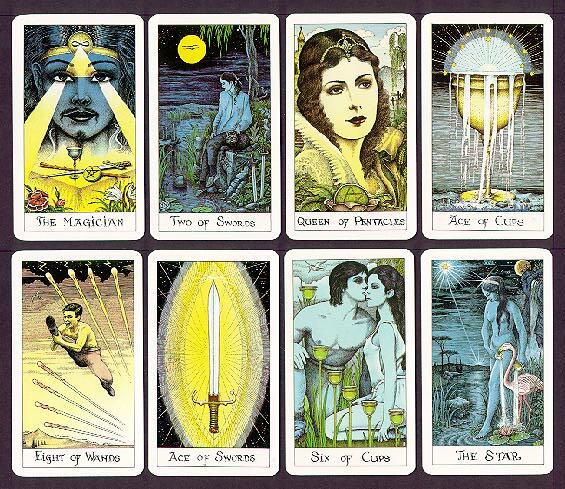 Comments: A stunningly beautiful deck, different yet in the traditional tarot form. Faces in this deck have piercing eyes & some eyes have piercing rays, too. The Star reminds us of Leonardo's Leda & the swan, the motif of the 6 of Cups is shown again in the background of the 7 of Cups. The Ace of Swords shows not only the Sword, but behind it, the Vesica Piscis, the female lozenge symbol (often placed behind Christ in old medieval art), so a card that shows the male sword emerging from the female form, a singularity from a singularity. The artist is self-taught, which we think helps give this deck its revealing nature.